This year’s Newport Boat Show, April 18-21, will feature the debut of a truly unique vessel: the HeliCat. This new 22-foot high-speed catamaran can travel 20-30 mph in conditions as rough as whitecap waves while getting an astonishing 5 mpg fuel economy: a feat that is not possible in other boats. It is built as a two-seater, fore and aft like a motorcycle, and it gives that same open-air feeling of exhilaration. But there’s no road traffic to maneuver around when you’re driving a HeliCat. Those who need a fast, safe and dependable form of water transportation will appreciate the HeliCat’s low maintenance requirements and excellent fuel economy, Williamson said. And with watertight compartments and foam floatation in each hull, the boat is described as virtually unsinkable. It weighs less than 2,500 pounds and can be towed by almost any car, with an aluminum trailer that was specifically built for the HeliCat. 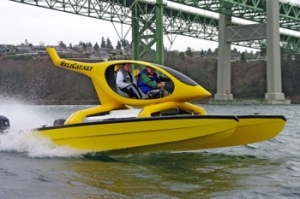 While the prototypes were from Argentina, new HeliCats will be built by Sunbacker Fiberglass in Monroe, Wash.
For more details, visit helicat.net — and to see the HeliCat for yourself, visit the Newport Boat Show.